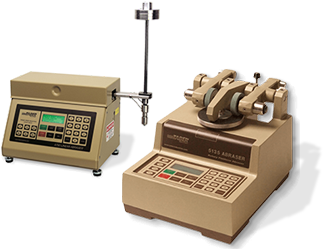 Taber Industries - Materials Test and Measurement instruments are RoHS-2 compliant. The Restriction of Hazardous Substances (RoHS) Directive 2002/95/EC of the European Parliament and Directive 2011/65/EU (RoHS-2) stipulate that certain hazardous substances must not be present above defined levels in electrical and electronic products after July 1st, 2006 with some product exceptions. Taber continues testing for viable alternatives to replace any exempted materials that may be in use. In the event that alternative materials cannot be identified and qualified as suitable replacements for materials currently using exemption 7(a) or 7(c)-I, Taber Industries will prepare and submit an application for renewing exemptions as defined in Article 5 and Annex V of the RoHS-2. The European Parliament stipulates that producers of electrical and electronic equipment are responsible for its reuse, recycling or disposal at the end of its useful life. Taber Industries - Materials Test and Measurement products are sold in Europe by authorized, independent resellers and our practice is to work through our resellers to satisfy this directive. For additional information on a reseller's specific policy, please contact them directly.